Size: (sheet) 15 x 17.5 cm; (plate) 6.2 x 8.2 cm. 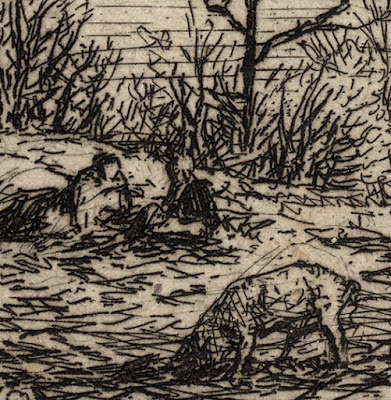 Inscribed in the plate with the artist’s signature (upper-right corner); numbered “4” (lower-left corner; with the publishers address, “'Imp. Delatre R. Bievre” (lower-right). Guiffrey 1866 151 (undescribed state); IFF 248. 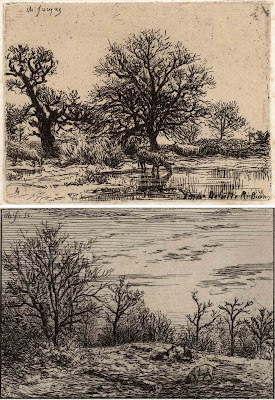 (lower image) “Paysage: Hiver” G.107 [Landscape: Winter], 1846, printed by Auguste Delâtre. The British Museum offers the following description of the lower print: “Winter landscape, with two figures sitting at the edge of a wood; below, a pig foraging for food.” (http://www.britishmuseum.org/research/collection_online/collection_object_details.aspx?objectId=3359656&partId=1&people=119978&page=1). Condition: crisp impressions on chine collé with large margins but with significant foxing to the margins; otherwise in good condition (i.e. beyond the foxing issue, there are no folds, holes or tears). I am selling this pair of small but beautifully executed etchings by one of the leading artists of the Barbizon School for the total cost of AU$128 (currently US$93.07/EUR82.62/GBP64.57 at the time of posting this pair of prints) including postage and handling to anywhere in the world. 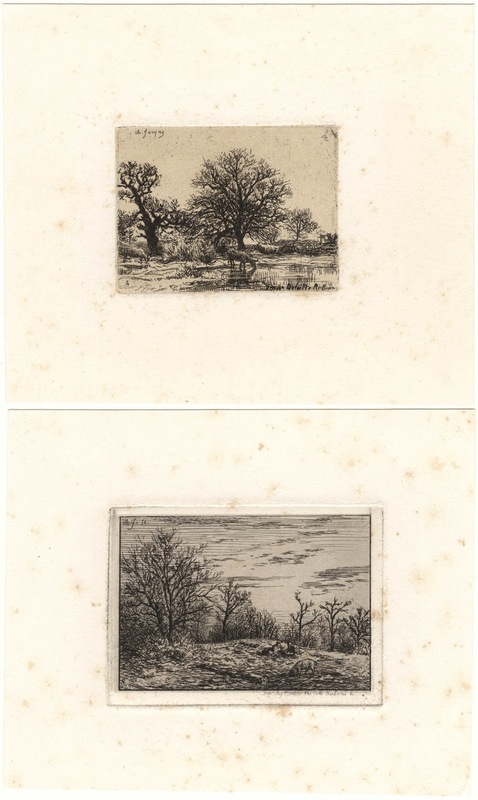 If you are interested in purchasing these original Jacque etchings exemplifying the spirit of the Barbizon School, please contact me (oz_jim@printsandprinciples.com) and I will send you a PayPal invoice to make the payment easy. Rather than giving an account of how these small but highly evocative prints by the great master of the Barbizon School exemplify the romantic spirit of the 19th century, I have decided to shift the focus to a more fundamental issue underpinning them: the artist’s approach to landscape drawing. If I were to ask Jacque—which of course is highly hypothetical as he passed away in 1894—about his approach to choosing his viewing position for these scenes, I have little doubt that my query would seem almost dumb. 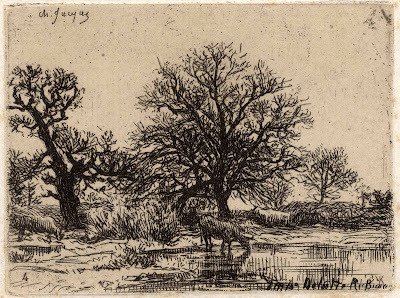 After all, artists tend to choose their site for drawing a scene based on what appeals to them. When I look at this scene, however, I see an approach to selecting a drawing position that is far from normal, especially for an Australian chap like me. The issue is not about the choice of subject, but rather where artists are likely to situate themselves. 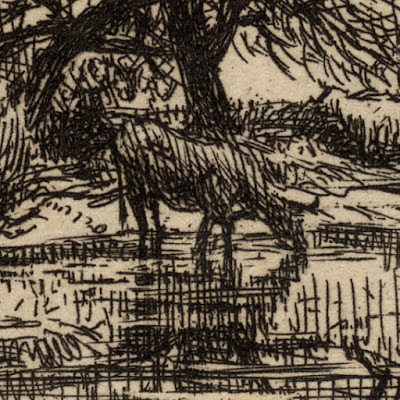 In the case of Jacque, both of his prints reveal that he has chosen a drawing site that is out in the open in full sun—most likely to keep warm. From my personal experience of working in the hot tropics, only mad dogs and Englishmen (pardon my appropriation of Noel Coward’s lyrics) would choose to work in full sun. In short, what may seem normal approach for a European artist is not always seen the same way for those living in hot spots. Another issue that I perceive in Jacque’s choice of drawing position is that his viewpoint in these prints is elevated suggesting that he drew while standing. This angle of view is again at odds with the usual drawing approaches of fellow North Queensland artists who tend to sit down to draw resulting in images with a low viewpoint. Although I can appreciate that not everyone would be fascinated with interrogating images to try and determine an artist’s practice in drawing, such deliberations can be very revealing. Certainly I have found that asking the fundamental questions “how, when, where and why?” when looking at prints can reveal interesting insights into an artist’s mindset and everyday issues beyond what is portrayed. Like many European artists that like to work in the sun to keep warm, this approach has significant ramifications to their compositions as it means that their foregrounds will be light in tone. 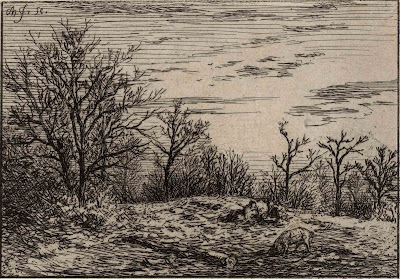 Moreover, standing up while drawing likewise changes the viewpoint from an intimate and "up close" image to a more panoramic one.